Fred Warne's first car, a 1933 Austin Seven saloon, was packed with the sort of goodies that would make any driver delighted, even today. The deluxe model came complete with sliding sunroof, outside semaphore trafficators, heavy duty front chrome bumpers, leather inflatable front and rear seats and a rear window blind. The car's previous owner lived at Rock and used it only to come to Wadebridge for her weekly shopping and on her return the car was washed and put away in the garage. My parents agreed to pay the £35 for me to purchase it. In return I would pay for the licence and insurance and cover any repairs and running costs. We would both use it, but as both my parents were on the large side it was a bit of a tight squeeze and consequently they didn't use it very much. The road tax in 1936 was £6 per year. I was qualified to drive a car before the purchase as I had taken my driving test in Truro, which I passed the first time, and my driving licence was duly stamped in red on the 1935/36 page and I still have that licence today. I had many trips to Plymouth, Torquay and all around Cornwall and just before the war I was courting my wife (we have celebrated 57 years married) and have many happy memories of trips together. On January 10, 1940, I was called up to serve in the RAF and naturally the car was laid up for the duration on blocks, and a dust sheet covered it. On various leave times the engine was started up and run in the garage. On my discharge from the RAF in December 1945, I returned to my previous job in the garage and as soon as I qualified for petrol coupons, out came the Austin Seven and it was great for my wife and I to enjoy our trips. My wife Vera and I were married in 1942, by which time my father had died, so my wife, my mum and I had many enjoyable trips together. On my yearly holiday (one week), but not during the summer season, we had trips to many places but our longest trips were to Blackpool to see the lights. We stayed in the house I was billeted in, in the initial training of my early RAF days. It is with great pride that I can say my Austin Seven never let me down. The only anxious moment was when we were returning from Gloucester and it started to snow; on my way home it eased off a bit but about half-way home I had a puncture in the back wheel. 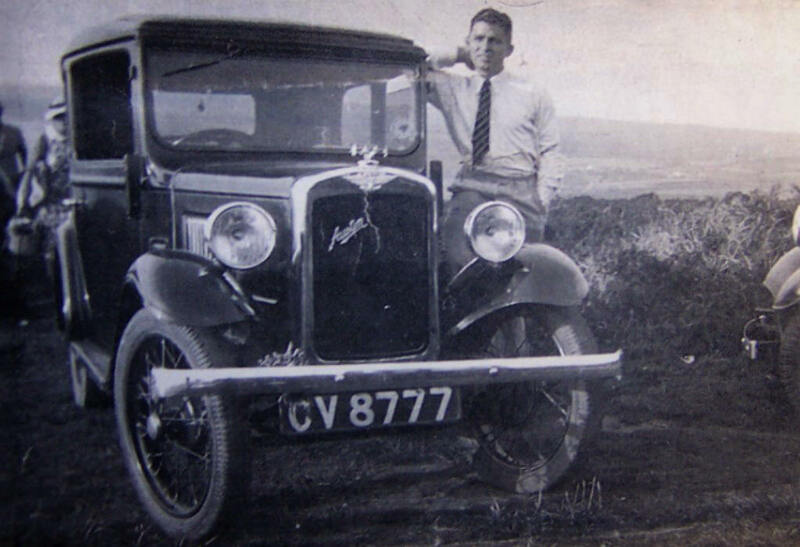 I didn't like to travel very far with no spare wheel and try as I may, at every garage I passed, nobody was interested in repairing a puncture, but our ever faithful Austin Seven, as usual, got us home without any further problems. Of course, before each holiday trip I was very careful to overhaul everything. I was able to do this job and over the years it was quite easy as I knew just about every nut and bolt. The engine was removed (the fastest time was about half and hour) and in those days I was able to lift the engine out manually on to a nearby bench to strip and give the engine a de-coke, grind in the valves, check the clutch and examine the crank shaft rear main roller bearing, which nearly always needed attention or renewal. Another important check was the two jets which splashed the big end bearings (not pressure fed) for if for any reason these jets blocked, it resulted in engine seizure. On the road a low reading of 2-5 lbs/square inch meant everything was all right, but a high reading of 10 lbs/square inch meant big trouble as the jets, one or both, had blocked up. Only once did I have a problem, when my wife and I were on our way to Torquay on a very hot day one summer, and climbing up the steep hill towards Hessary Tor the engine overheated and began to boil. I thought I had stopped and waited long enough for it to cool down, but apparently I hadn't and when I removed the radiator cap I had more than one red face, but not blistered. I filled it up eventually and continued our trip without any further problems. One trip to Gloucester we will always recall when by this time we had an extra passenger. The back seat was piled high with luggage, food, cases, etc., which meant there was just room for a carrycot, in which was our three-month-old daughter. We had strong winds and gales but we were so heavily loaded it was to our advantage and we had a safe and uneventful journey again. As for spare parts, it was very comfortable to know so many garages kept an "Austin Seven First Aid Kit". We enjoyed our Austin Seven, which gave us 30 years' good service, but inevitably as the family grew we needed a bigger car. It was heartbreaking really to have to part with it, and CV 8777 was my first love. So I blew up both front and rear seats and delivered the car to a buyer in St Kew at an agreed price of £35, the same as I bought it for 30 years previously. I looked back at my family as I drove off to deliver it to its new owners and there wasn't a dry eye among them. My turn came later when I finally handed the car over; I still have a full petrol ration book for CV8777. With countless miles on the clock I hasten to add that the four wings/mudguards and the rubber running were neither dented nor rusty. The inside rubber mats were always covered with rush mats and were also in good condition. The opening windscreen was made permanent when I fitted a new screen. The sunshine roof leaked and so I had to remove it and covered the top with fabric. I did see CV 8777 about 10 years ago (late 1980's), with its present owner, whom I met by accident in Truro. His intention was to restore it but it was left out in the open and looked a very sorry sight. But if ever he does bring it up to how I remember it I hope I shall be privileged to see it." This article originally appeared in the Western Morning News on Tuesday November 10th 1998, and whose copyright we fully respect. Fred is now 91 and has only recently stopped driving. He readily agreed to my recommendation that it should be published in Focus (June 2009 pp10-12) and possibly elsewhere in Austin Seven circles. - Bob Neale. Fred's daughter, Fay, brought him along to the Trelawney Garden Centre, Wadebridge to see a number of our Sevens during our lunch stop on our 'Seven Saints Run' on June 14th 2009. He was delighted to see a range of 'Seven' models and to talk about his days with his 'Seven'. Sadly his old 'Seven' no longer exists. A later owner suffered a garage incident and the car was badly damaged; when the owner died the subsequent restoration project did not materialise. 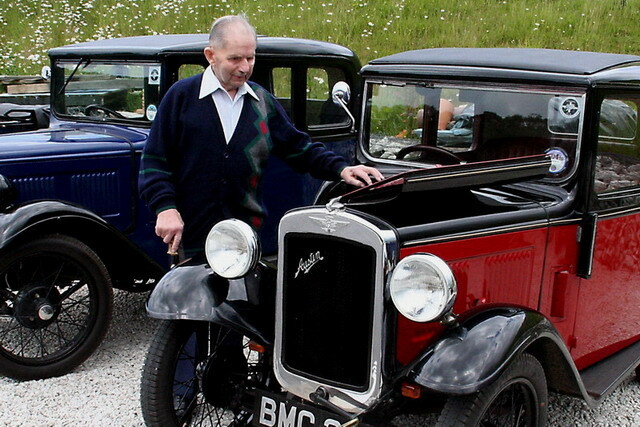 Sadly Fred passed away on 5 January 2011, just a few months before his 93rd birthday, after a short illness. We have lost a good friend who kept his interest in Austin Sevens until the end. He enjoyed reading articles in our magazine and seeing our 'Sevens' out on the roads when his daughter, Fay, brought him along to see us on a few events in the past few years. He will be greatly missed by everyone who knew him.